It's been suggested several times lately that I should lend an ear to Rajesh Roshan. Point taken. Unfortunately though, all I have at the moment are these two (rather worn) EPs. 'Des Pardes' is the most scratchy, but least interesting. Though not bad. All tracks have an upbeat, pleasant pop feel to them, 'Aap Kahen' with its nifty breaks being my favourite. But nothing that stands out in a big way. Cool sleeve, very mod. 'Vishwanath' I like a lot; it sounds different from most other scores of the period. Not particularly western, nor particularly Indian (not traditional anyway); it does however sound particularly dramatic, tense, and great. Everything on it is worthwhile, 'Bibasha-Aaj Karegi Man Mani' being the big draw. Machine-gun percussion, jazzy breaks, sound effects, soaring horns and strings - it's awesome! 'Hawa Se Halki' comes a close second. As often with EPs though, the songs are edited... one reason why I'm keeping an eye out for the LP of this. I'll give these a try although Rajesh Roshan's never been one of my favorites. His father on the other hand wrote some of my most favorite music from the 50s and 60s. They're definitely worth a listen, especially Viswanath. Howja even know whether there ARE full length LP's of these? Seen 'em on eBay. Des Pardes I don't need, Vishwanath I've only seen rubbish quality copies of. Wow, you weren't kidding about 'Des Pardes' being scratchy! Despite that the album is a pretty good listen; nothing too dull or jarring. Same goes for 'Vishwanath'. Most of these eight tracks are new to me, but they're well worth getting. "Bibasha" is totally awesome, and definitely my fave out of all the tracks. 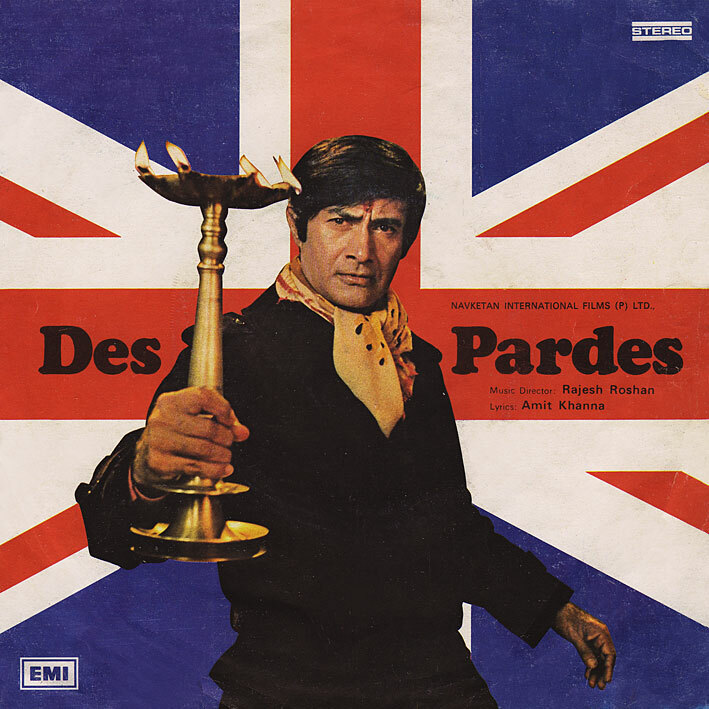 Should be LPs out there since Des Pardes had like 6 songs in the movie. I think this was the first time that Dev Anand moved away from the Burmans (SD or RD) to score his movies. It has never been the same. Unfortunately 'scratchy' is the case with quite a few of my EPs (including some Burman's I'll be posting later). I initially considered not posting them at all, but figured, what the hell, have a listen and if you like the songs, find better versions elsewhere. Or something. The best two tracks of Des Pardes are missing in the EP! BTW Des Pardes remains one of the career defining score of Rajesh Roshan! 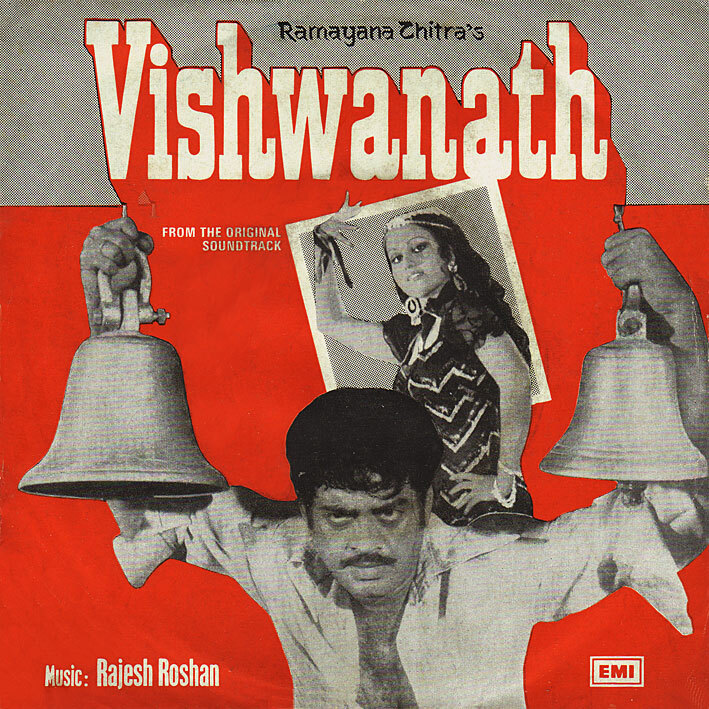 A little trivia on Vishwanath - Rajesh Roshan have worked only once with Subhash Ghai, and that was for this movie! Subhash Ghai has made several musicals - Vishwanath, Krodhi, Karz, Gautam Govinda, Vidhata, Hero, Meri Jung, Karma, Ram Lakhan, Saudagar,Pardes, Tall, and the recent one - Yuvvraaj! Thanx for adding Rajesh Roshan's music to your inimitable collection. "Nazrana bheja kisi ne pyar ka" is a good one to listen from "Des-Pardes"
By any chance do you have Laawaris, Naseeb, Love Story, Satte Pe Satta, Namak Halal, Sharabi, Aasha, Sargam? Thank You for these gems, greatly appreciated !!. I see you've got other great albums lined up for the future. Will you be posting Heera Panna and Caravan soon after ? (just wondering). Princeali: They'll probably be a while to be honest, closer to the end of the blog. At least Caravan. Viz: Laawaris maybe, the others I don't think so. Thanks PC. Your blog is one of the very best on the Net. Besides the songs, you give excellent descriptions, and fantastic vinyl covers. Yeah, I actually take after Gandhi, he thought love should be given to friend and foe. And on the plus side all my student jobs have involved some costumer service, so that helped as well in writing a calm sensible response. (But in some cases that actually gets them even madder, which is not my intension.) Anyway, thanks for your comment. Hope everything is going well for Thursday. Bye.